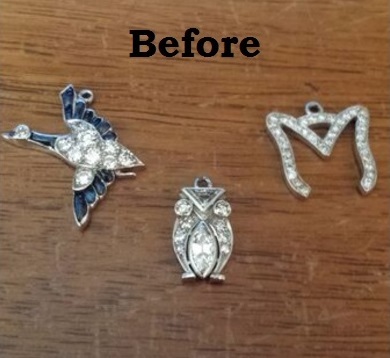 Three Charms I Re-purposed for a Client. You Might Like What we Did With Them. Carla called me about some inherited charms. I liked her story and I loved her charms. Follow her story and maybe find some inspiration for any charms you may be harboring. Carla told me, "I’ve inherited charms on a bracelet. Some of them I love and remember their stories and some don’t have a lot of meaning for me. I managed to not only get a charm caught between two keys on my keyboard at work, but I ripped off one of the keypad letters when I yanked the stuck charm up. Fortunately, my boss has forgiven me for the damage I caused to my keyboard." "I took them off the charms and just wear the bracelet by itself. It looks nice and reminds me of my Aunt who left it to me. It’s been about six years now and I’d like to do something else with some of the charms. They are very beautiful charms and it kills me that they just sit unworn like that." "I won’t wear them as earrings, because I like symmetry. I do wear pins. I have a ton of pendants, so if I turned them into pendants they’d rarely be worn. I need a bright idea here. Do you have any?" I thought a pin would be the most likely to be worn by Carla. A straight bar sounded boring in my mind so I showed her different ring designs to get a sense of the styles she gravitated towards. 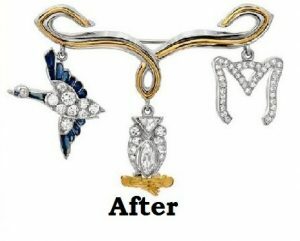 When you are stuck when trying to re-design a piece of your jewelry and don't know where to start, start with establishing your taste. Look at earrings, rings or pendant designs. You can do this in person with your jeweler or look at pictures. 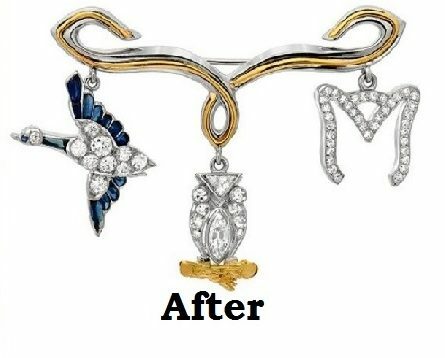 Look at the details of jewelry you are drawn to, like a curve, an engraving, a symbol, a taper or a certain dome height on top. 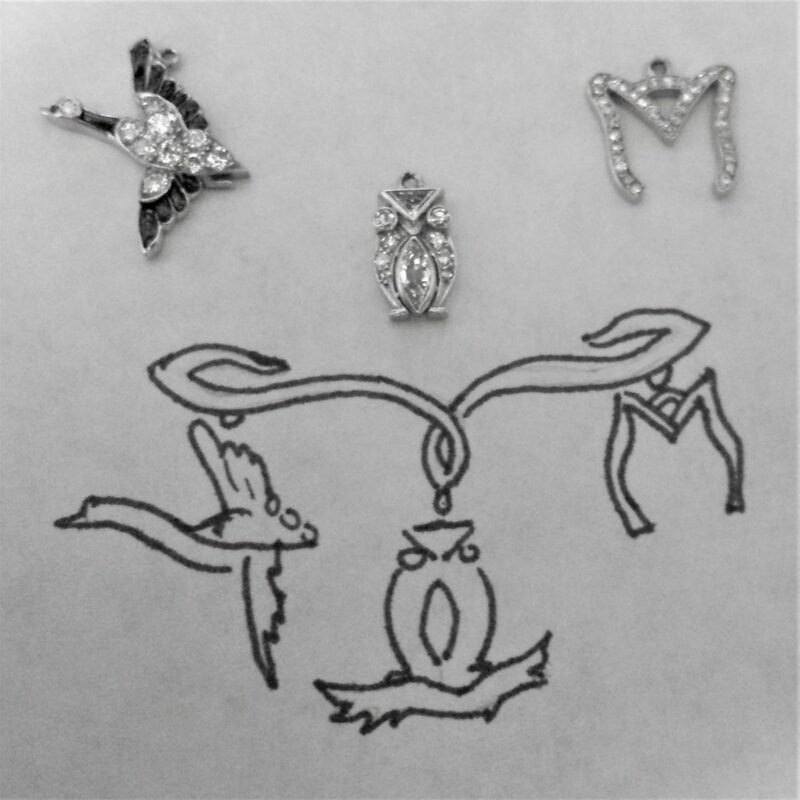 Put together pictures of the jewelry that attracts you with little arrows to point to your favorite little details. Show these to your jeweler as a starting point. In Carla's case it turned out she liked my Art Nouveau designs and asked me to use that flowing style in the pin design with her inherited charms. After drawing a few iterations she chose her favorite. 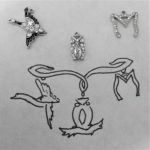 Would you like a custom designed pin top design to show your inherited charms? You could create a Pinterest board of designs and styles that appeal to your taste and perhaps thematically go with your charms or remind you of your Auntie. From there a pin top could be created for your charms.